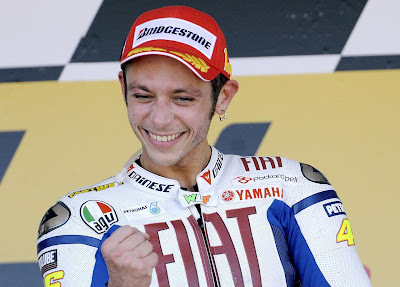 Valentino Rossi aka The Doctor, won his first Moto GP race in the year 2009 on his 2009 Yamaha M1 beating Dani Pedrosa, riding his Respol Honda, by a "huge" margin of 2.7 seconds. The main highlight was as usual the breath stopping competition between Rossi and his arched rival, the Ducati Marlboro rider Casey Stoner. Amongst all this, it's was a real bad day for Rossi's partner Jay Lorenzo who crashed his 2009 M1. Just couldn't stop myself from mentioning about this video of the competition between Rossi and Stonner in the 2008 season, I found on Youtube. Just look at the maneuvering of Rossi... simply masterpiece. First of all..... I really really hope you are doing well and have recovered a lot from that nasty crash!! Yeah, just looking at the video, you feel, boy that's the way to ride such a powerfull bike!! It's like Harry Potter moving his magic wand!! 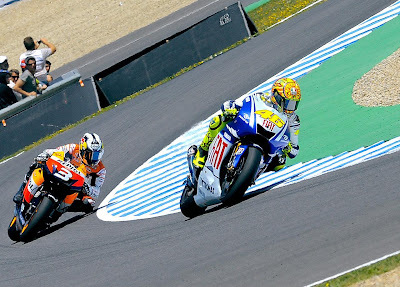 it might sound surprising to you.. but I have never followed Moto GP till date..